There are some important factors to take into consideration when ordering back painted glass. 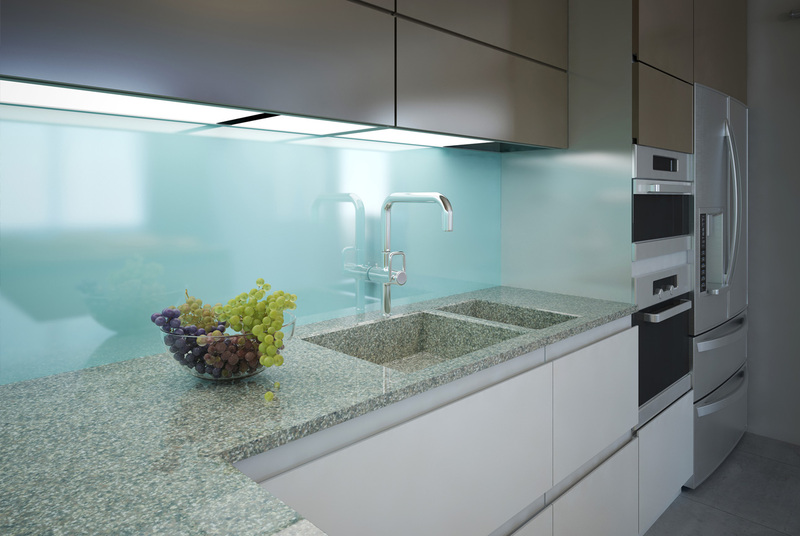 Standard Float glass has a slight green appearance to it, due to the iron content of the glass. It is not a tinted glass, the thicker the glass, the darker it appears to be. When painted, especially with lighter colours, the painting can appear to have a tint to it. When viewed from the face side, the thicker the glass the more tinted it appears to be. In order to maintain the same paint colour, the same thickness of glass should be used throughout the installation. Low Iron Float glass does not have the same hue to it and when painted with lighter colours will not appear tinted. If different thicknesses of glass are required Low Iron float glass should be used throughout the job. Due to the increased reflection when painted, the painted colour can appear lighter with certain colours. Our paint mixing system is based on RAL & Pantone numbers. A match can be made for Dulux colours; however we do not guarantee to match a Dulux colour exactly. Printed colour swatches may also not be matched exactly. Jobs should be ordered as one lot if at all possible. It is inevitable there will be variations in batches of paint mixed and sprayed at different times and we therefore cannot undertake to match different lots/batches exactly. Metallic finishes are achieved by mixing metal particles in the paint and these may not disperse evenly throughout the mix and can appear in concentrations at certain viewing angles. These concentrations cannot be avoided and are deemed acceptable if not visible when viewed from 3 metres at 90 degrees. In common with other paints the, size, shape and lighting conditions can influence the appearance of the final colour. Samples can be provided but will be charged for and credited if an order is placed. The positioning of, holes, socket cut outs, and notches, must all be in accordance with the industry standard for processed glass. All back painted glass will be foil backed for fixing with mirror adhesive or low modulus silicone. Our paint process has been tested to an American Standard for adhesion, ASTM D3359, with appropriate modifications suggested by the paint manufacturer.